After Pingu, the dancing one from Happy Feet and the Batman villain, there can be few more famous penguins than Sir Nils Olav. His story begins in 1913, when the Lord Edward Theodore Salvesen, son of Norwegian shipping magnate Christian Salvesen, presented the newly opened Edinburgh Zoo with a king penguin as a gift, and donated funds to support the development of its own king penguin colony. Given Norway’s successful expedition to the South Pole under Roald Amundsen two years earlier, it was an apt gesture. Half a century later, in 1961, His Majesty the King’s Guard Music and Drill Company visited Edinburgh Military Tattoo for the first time. The King’s Guard’s officer in charge, Lieutenant Nils Egelien, was fascinated by the colony of king penguins at Edinburgh Zoo and, when the Guards returned to the city in 1972, Nils arranged to adopt one. The adopted penguin was named Nils Olav, partly after Nils Egelien and partly in honour of King Olav V of Norway. Nils Olav started his career with the King’s Guard with the title of Lance Corporal, and has been the unit’s official mascot ever since. 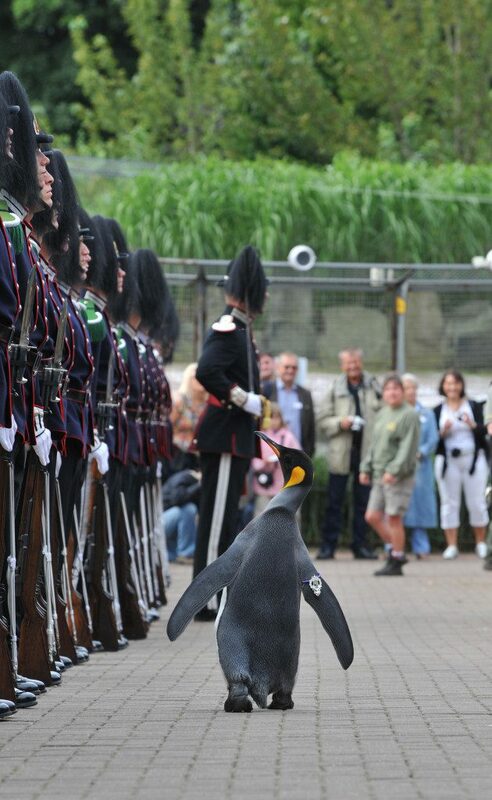 Since 1972, Nils Olav has been promoted almost every time the King’s Guard visits the Tattoo. In 1982, he was appointed Corporal, and in 1987 he became Sergeant – always with the regimental insignia tied to his right flipper. But tragedy struck. Soon after his second promotion, Nils Olav died. Fortunately, a two-year-old penguin was prepared to assume his responsibilities, and in 1993, Nils Olav the Second was promoted to Regimental Sergeant Major, upgraded to Honourable Regimental Sergeant Major in 2001. 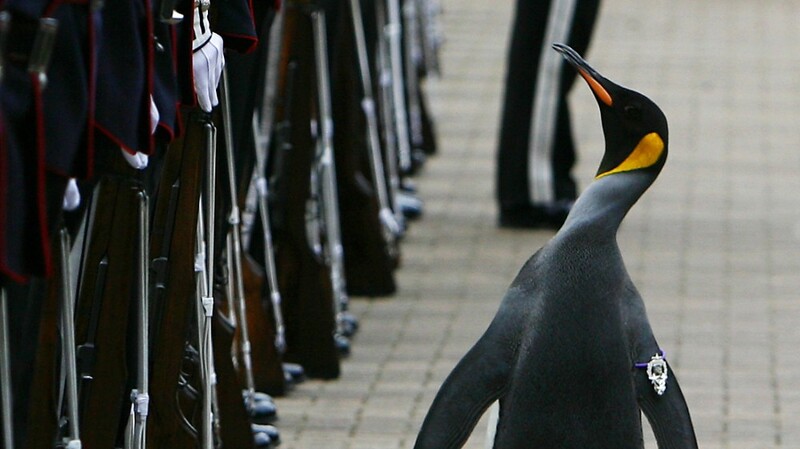 In 2005, Nils Olav finally cracked the officers’ ranks and became Major. That same year he had two statues erected in his honour – one at Edinburgh Zoo and the other in Huseby Camp in Oslo, home of His Majesty the King’s Guard. In 2008, Nils Olav received a knighthood, and his new title became Colonel-in-Chief, Sir Nils Olav. But when His Majesty the King’s Guard visited Edinburgh Military Tattoo in 2012, Sir Nils missed out on his promotion – not because the glory was going to his head, but because the entire colony had been temporarily relocated to the south of England because Edinburgh Zoo was undergoing renovation.